Acetaminophen, sold over the counter as Tylenol, is one of the world’s most widely used pain relievers. But too much of the drug can lead to serious liver damage. Now, new research from OMRF has pinpointed the cause of liver bleeding during acetaminophen overdose. OMRF scientists have also discovered a new potential treatment for the condition, which often strikes users of Percocet and Vicodin, pain medications that also contain acetaminophen. 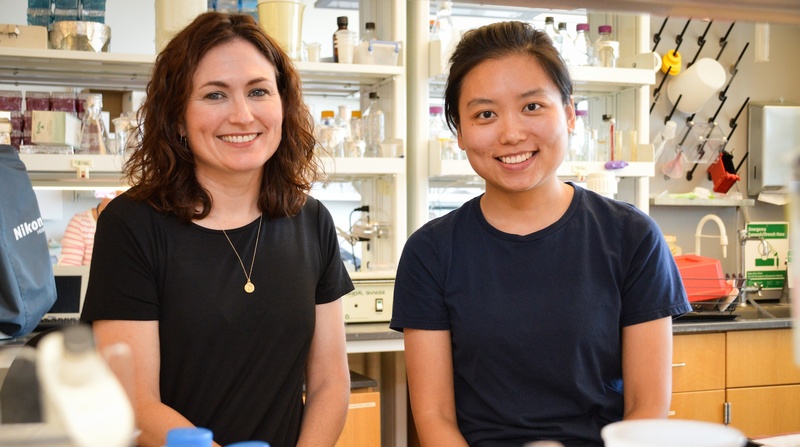 OMRF scientists Courtney Griffin, Ph.D., and Siqi Gao discovered that a marked increase in the activity of an enzyme called plasmin caused liver bleeding in the event of acetaminophen overdose. Griffin and Gao broke new ground by making a connection between plasmin activity and liver bleeding following acetaminophen overdose. While this finding is important on its own, Griffin said, the OMRF researchers also made a related discovery that yielded important treatment options for overdose patients. In laboratory mice, the scientists were able to reduce plasmin levels through treatment with tranexamic acid, a prescription medication used to prevent excess blood loss from major trauma or surgeries. “If the plasmin is breaking down the blood vessels and causing them to rupture, this can help dampen that effect to prevent excessive bleeding,” said Griffin. The treatment impact of the findings could be significant, said Griffin, especially since tranexamic acid has already been approved by the Food and Drug Administration for another condition. The new findings were published in the journal Hepatology. OMRF researchers Florea Lupu, Ph.D., and Robert Silasi-Mansat, Ph.D., also contributed to the findings. This work was supported by grant No. P30GM114731 from the National Institute of General Medical Sciences, a part of the National Institutes of Health.